Go iLawn is the green industry’s go-to resource for online property measurement needs. Thousands of contractors across the country are using Go iLawn to measure, bid and win more sales. 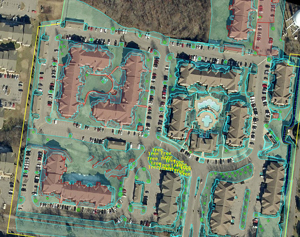 High resolution property photos and point-and-click measuring tools allow you to create accurate proposals faster and better than ever before. Commercial Property Measured by Gardens of Babylon, Nashville, TN. Measure properties anytime, anywhere regardless of weather conditions or time of day. 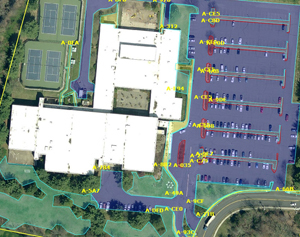 Anyone at the office can use this amazing tool to measure any outdoor surface of a property. Quickly quantify materials and equipment needed to get the job done. Not only can you measure square footage of turf, beds, parking lots etc., you can calculate how much mulch you need with Go iLawn’s volume calculator. Boost job site efficiency and performance with detailed Go iLawn site maps. Distribute color-coded site maps to office staff, customer and crew, and everyone is literally on the same page. Learn more about our online property measuring tool for landscapers. 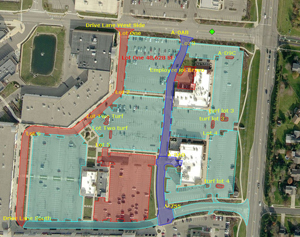 Measure parking lots and sidewalks faster than ever before. Accurately measure odd shaped lots and large jobs like HOA’s in half the time it takes to measure the traditional way. Use these measurements to help you estimate the amount of deicing materials needed to properly clear walks, streets and lots. 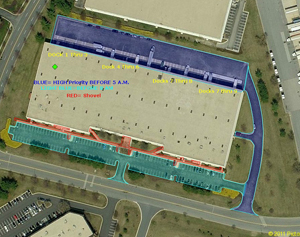 Plan for event management by identifying obstacles, storm water drains, lot entrances and handicap stalls with high resolution property photos. Produce site diagrams for property managers, office staff, crews and subcontractors with detailed information such as where the snow will be piled, what equipment will be used and when the property will be serviced. Learn more about our parking lot measuring tools for snow and ice management. Powerful tools help you easily measure the hard-to-measure. Asymmetrical boundaries? No problem! 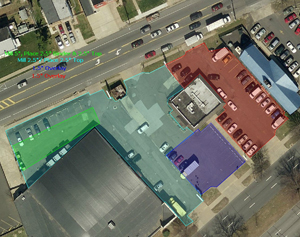 Go iLawn’s point-and-click tool set allows you to measure parking lots and roads of all shapes and sizes. Plus, you can edit completed measurements to be as precise as possible. Need to draw a 10’ line? Done. Real-time measuring tools display measurement results in the application while the tools are in use, making it easy to accurately measure and draw line striping, pavement patches and pavement repairs. Property photos double as an awe inducing sales tool. When it’s all said and done you can print a labeled site diagram with color-coded job execution strategy on a high resolution photo to impress your customers and guide your crews. Learn more about our pavement maintenance measuring tools. Measure properties of any size for any service! Quickly assign equipment and materials to your Go iLawn measurements with our lawn and snow proposal builders to produce accurate pricing for your landscaping and snow removal proposals. Standardize the proposal process at your company by creating proposal templates that everyone at the office (from administrator to head estimator) can use. Generate a professional proposal document with property photos, site diagrams and scope of work details in minutes. Learn more about our landscaping and snow removal proposal builders. A picture says a thousand words. Browse our user photo gallery to see how our users (actual contractors) are using Go iLawn to measure properties and win sales. Need hands-on experience? Try ALL the Go iLawn Tools in our free test drive. There’s a practice property ready and waiting for you to measure it, and you can search for up to 3 properties where you work.